A sweeping study of the “bipolar” struggle between the two superpowers that moved from ideological conflict to permanent military confrontation. 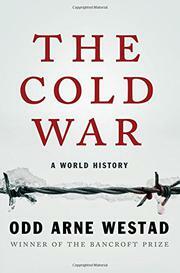 In astute, thematic chapters, Bancroft Award–winning historian Westad (U.S.–Asia Relations/Harvard Univ. ; Restless Empire: China and the World Since 1750, 2012, etc.) offers an excellent sense of the ideological conflicts fulminating since the late 19th century that formed the crux of the Cold War. The forces of modernity that were rapidly and profoundly transforming society in Europe and America were also creating vast swaths of human misery, and socialism and communism rose to support “the ordinary men and women who were being thrown into capitalism’s centrifuge.” Proceeding chronologically, the author shows how these movements of workers joined other campaigns—e.g., women’s rights and anti-colonialism—to present a challenge to the rise of American power in the 20th century. Thus the “sharpening of the ideological divide between capitalism and its critics” found its momentum from one world war to the next, as the U.S. strove to “make the world safe for democracy” at the same time Russia expanded in a different, revolutionary direction. Westad emphasizes that the generation that shaped the Cold War was the same caught in the nightmare of World War I, and both struggles contained the same elements: “fear, uncertainty, the need for something to believe in, and the demand to create a better world.” This is an enormous story, and the author tackles it with admirable clarity and elegance, effectively laying out the positions of the two superpowers and their essential distrust of the other. From the “iron curtain” speech of Winston Churchill, “loss” of China to the Communists, tragedy of the Korean War, process of decolonization in Africa and Latin America, and the “age of Brezhnev” and Nixon in Beijing, Westad moves methodically through the stages of the Cold War. One of the essential themes is continually sounded: why, in the end, the Western model proved more attractive than that of the Soviets. A tremendous and timely history lesson for our age. THERE IS NO FREEDOM WITHOUT BREAD!